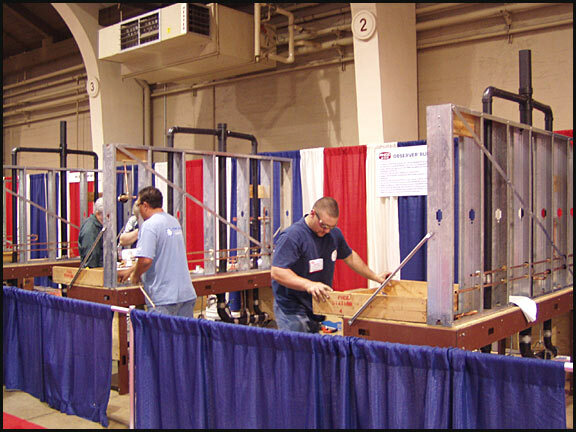 At last month’s Los Angeles Area PHCC Trade Show LeDuc & Dexter’s fourth year apprentice John Jones finished second in the apprenticeship competition. Jones competed against 8 other apprentices chosen from each of the 8 regional apprenticeship schools in California. John Jones represented the Redwood Empire PHCC, who paid for his round trip travel expenses to the L.A. County Fair & Exposition Complex in Pomona where the competition was held. 9,000 people attended this year’s trade show. For finishing second, he was awarded $500.00 cash and a generous tool and prize package. The apprenticeship competition consisted of a time-limited construction of rough and finished bathroom. Jones competed for the second year in a row. Last year he also finished second in the apprenticeship competition. LeDuc & Dexter has been well represented in the apprenticeship competition with apprentices competing three of the last four years. Jim Hopper finished second in 2001, and Barbara Nguyen finished fourth in 2002. Tom LeDuc also attended the weekend PHCC Trade Show in Pomona and on Friday he participated in the quarterly PHCC Apprenticeship meeting. LeDuc is a PHCC Master Apprenticeship Committee Member and is also on a special educational committee that is in the process of creating a new and improved curriculum and textbook for the National PHCC apprenticeship program. The apprenticeship textbooks should all be completed by next year. At this quarterly PHCC meeting the subject of concentrated training was reviewed. It is being proposed that apprenticeship training for Northern California would be held in Sacramento at the former McClelland Air Force Base, which is now an industrial park. The apprentices would attend classes for 80 hours over a two-week period as opposed to the system used now where they attend night school once a week for 3 to 4 hours of instruction and lab time. In the discussion of committee members, most of whom are plumbing contractors, one member said it would be tough to send his 3 apprentices to training and lose the manpower in his small sized company. He was reminded that he could send them individually at different times in the year, thereby minimizing the manpower loss. That idea sounded better. Perhaps the whole idea of “concentrated training” for apprenticeship training would be better.